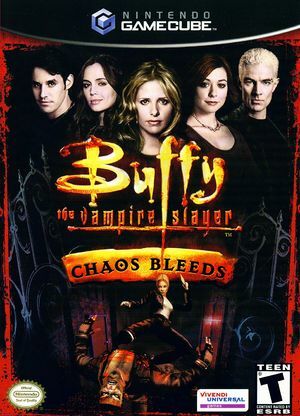 Buffy the Vampire Slayer: Chaos Bleeds is a 2003 video game and the fourth video game based on the Buffy the Vampire Slayer franchise. It is the first multiplatform game in the franchise as well as the first game in the franchise to allow players to control characters other than Buffy Summers and also the first game in the franchise to feature a fully developed multiplayer mode; additional players had a limited ability to interact in a hidden debugging mode in the previous title: Buffy the Vampire Slayer. Buffy the Vampire Slayer: Chaos Bleeds has a native 16:9 display option, but it requires enabling it in its internal options and setting Dolphin's Aspect Ratio graphics setting to "Auto". Using the widescreen hack with this title is not recommended. The graph below charts the compatibility with Buffy the Vampire Slayer: Chaos Bleeds since Dolphin's 2.0 release, listing revisions only where a compatibility change occurred. This page was last edited on 27 September 2017, at 06:56.